The mayhem and bedlam that demolished downtown Halifax during VE-Day celebrations gone wild merited the screaming headlines. The scale of the violence was unprecedented and the timing couldn’t have been worse. 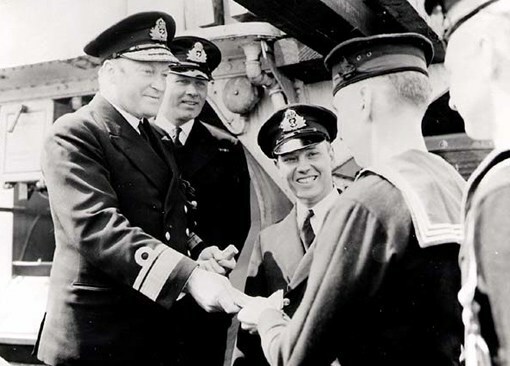 The Royal Canadian Navy, having grown at an unprecedented pace to become one of the largest navies in the world, was hell-bent and determined to preserve the image and influence it had earned escorting convoys and hunting U-boats across the North Atlantic. A Naval Board of Inquiry was immediately convened, reporting before the end of the month. Nationally, the Liberal government of Prime Minister William Lyon Mackenzie King was in the midst of an election campaign, facing a challenge from a resurgent Progressive Conservative Party of Canada. It was delighted to punt the whole affair into the hands of a Royal Commission, appearing to take action, but safe in the knowledge the Royal Commission would not report until after voters cast their ballots on June 11, 1945. The Royal Commission on the Halifax Disorders, May 7–8, 1945 by Honourable Mister Justice R.L. Kellock was established on the Thursday after the riots and reported on July 28, 1945, seven weeks after the election. Directorate of History and Heritage historian R.H. Caldwell rightly dismisses this explanation as tripe. If this was a navy-wide problem it should have occurred “overseas and in Canada, throughout the war,” he avers. And it didn’t. Caldwell takes his examination of the riots one step deeper, examining strains peculiar to the RCN and circumstances unique to the city of Halifax during the war. In a similar fashion, the Kellock Royal Commission avoided generalizing and sought specific roots distinctive to the Halifax outburst. It found it in the persons of RAdm Leonard W. Murray, commander of Canadian North-West Atlantic, and LCdr Wood, commanding officer of the Shore Patrol at HMCS Stadacona and the senior officer in Halifax. Over three days Murray had submitted to a scathing examination. Wood was subject to a similar going-over and the commission’s report was blunt. The third focused on LCdr Wood, citing his failure “to report the situation on Barrington St., before the attacks on the liquor stores to his superiors so that effective action might be taken by the navy itself to clear the streets of its rioting personnel.” Murray testified to the commission that he had no idea of events on the night of May 7 until mid-morning May 8, long after he had again released thousands of libertymen into the city. This observation is not meant to exonerate Murray, although it does stand as stark evidence that the gravity of the situation was not communicated up the chain of command adequately. This criticism hardly strikes at the heart of the matter, however. The first two points shortly and sharply pilloried Murray and Wood. In the first place, Kellock concluded that thousands of naval personnel should not have been loose on the streets of Halifax: “In my opinion, therefore, the disturbances of May 7th and the early hours of May 8th were due to: (1) Failure on the part of the naval command to plan, in accordance with the requirements laid down by Admiral Murray himself, for the entertainment of the ratings in their own establishments for the purpose of keeping them off the streets.” Pre-VE-Day planning had been predicated on civilians partaking of official celebrations in a largely shuttered city while service personnel celebrated separately onboard ship and on base. Testimony by various officials from the mayor to the chief of police confirmed this. The solemn tone and subtly, affirming words were Murray’s death knell. They also captured Murray’s direct and immediate responsibility for the scale and duration of the destruction. Across the RCN, indeed in military forces around the globe, plans were being made to prepare for VE-Day. Murray had clearly identified the issue, that celebrations could well get out of hand. He was not ignorant. Moreover, he had clearly identified what he saw as the solution. The report noted quite specifically: “in accordance with the requirements laid down by Admiral Murray himself.” However, it also stated, this had not happened due to “failure on the part of the naval command.” Setting aside semantics, the phrase might have just read ‘failure on the part of Admiral Leonard W. Murray.’ He was the theatre commander and also the senior RCN officer stationed in Halifax. Q: Looking at that Exhibit 77, there were thirteen thousand odd who were in a position to go ashore on Monday and 9,069 went ashore. And on Tuesday 9,508 went ashore? Q: Have you any actual data with the information of those that were ashore from establishments on Monday and were not ashore on Tuesday? A: No, I was speaking in general terms. But in the main the people on shore Tuesday would not be the same as were on shore on Monday. Q: But you would not be certain that those who participated in the troubles Monday night would not be on shore Tuesday? A: Not the particular individuals. Q: And the ring-leaders or actual participants on Monday night, most of them or all of them might be on shore on Tuesday? Kellock went on to note that approximately 300 copies of this order were circulated, meaning it may have been widely known. Even were it not, its effect, in practice, would have been recognized as policy as soon as the first uproars were not suppressed. Speaking plainly, Murray ordered the Shore Patrol to let the naval personnel have the run of the city. Murray blew it. He failed miserably. The riots were and will always remain his responsibility. A brilliant operations officer, he totally and completely mishandled civil-military relations in this most important instance.